Paul Silk, who's led the Commission on Devolution in Wales, has formally handed over his second report to the Welsh Secretary David Jones. It brings to an end the Commission's work after two and a half years of looking at the devolution settlement. Paul Silk, who chairs the Commission on Devolution in Wales, described the poll results as a 'real insight' but said he's aware of opposing views and urged as many people as possible to express those views before 27th December, the deadline for evidence. These results ... provide a real insight into the public’s views on the current powers of the National Assembly for Wales. The results are generally consistent with trends identified in other surveys, but whilst they show a continued growth in support for the National Assembly as an institution and for it to have further powers, we need to mindful that the people of Wales have differing views. We still want to hear as many views as possible, whatever they may be - we are still firmly in listening mode. We are taking evidence up until 27 September so please get involved, share your views and help us shape Wales’s future. Chair of the Commission Paul Silk, along with other members that authored a report into the way the Welsh Government is financed, will be questioned by the Welsh Select Committee today. The Commission published a report that proposed tax-raising powers for the Welsh Government last month. The Select Committee is expected to ask about some of the key elements of the report, with Paul Silk explaining his thinking behind the recommendations. 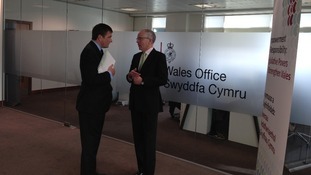 Mr Paul Silk, the Chair of the Commission on Devolution in Wales, has been updating the Welsh Secretary on the work the Commission has undertaken so far on the first part of its remit, which looks at the financial accountability of the National Assembly and the Welsh Government. The findings will be reported later in the year.